Concerning the smell in your house after your dog gets sprayed with a skunk, we called the Erie police! We thought our dog had been sprayed by pepper spray! We thought someone had intruded our back yard and the intruder sprayed the dog! The smell smelled like burning chemicals so we knew no better! Now we do. The non- emergency police patched us through to 911! Two squad cars showed up. They scoped our house at 1am in the morning only to sadly tell us they were pretty sure our dog was sprayed by a skunk! We were so upset, but the police were very helpful. They suggested we use Murphy's Oil soap on the dog! It worked except for her nose area. As far as the house. We did the candles, coffee grounds, incense, and the baking soda on the carpet which all seemed to help. It's now 2:50 am and we are finally breathing a little easier. I have to get up at 5 for work so I better say good night! Thanks to all for all the wonderful suggestions! I love this site. Yes, yes, yes, if I had not seen the actual skunk (and had to remove the little body) I would never have guessed my scottie got sprayed. it smelled like burnt tires! That was confusing. When skunks get caught on the road, there is always that musky smell, but when they spray it has an odd smell doesn't it? I quickly wiped her face with a wet towel, and did the bath with tomato juice, which did not work. Next day on internet found the formula of baking soda in dish with vinegar added and using the foam to clean her. Then a bath with Dawn original dish soap. That worked great. My groomer did warn me that the smell does come back when the dog gets damp, and that is true. I should probably have replaced her collar and that would have helped with the smell a bit (nylon collar). My Morkie just got sprayed by a skunk because he would not leave the skunk alone. Thankfully when my Rottie was sprayed a few years back I found the solution of 1/2 quart hydrogen peroxide, 1/4 cup of baking soda, and 2 tablespoons liquid Dawn soap in an open container. Works wonders. Now to get the smell out of my home. Sadly my morky will be spending the night in the basement, normally he would be in my room. I use BON-CC-41 on my dogs. They have been sprayed 3 times this year alone! Nothing works as well as this product. You can even get it on their face, unlike other products where you have to avoid the face. Nothing works as well! It can also be used all around the house which is very nice! I always carry some for the next time my dogs have an encounter with a skunk, and it will happen. In the middle of the night, on a freezing winter evening, a skunk and a possum had a marital spat in the underground den beneath our porch. This den is nestled next to our home's concrete foundation. 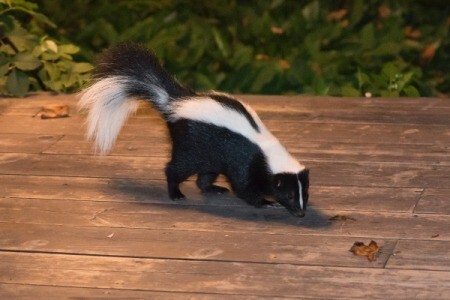 The skunk sprayed and the smell entered our basement (how we still don't know!). The vapor got pulled into the furnace enabling our central air system to distribute the fresh skunk spray to every room in the house! It came to us all of a sudden, smelling like hot burning rubber so extreme it woke up every person in the house, and we evacuated. The fire fighters who responded to our 9-1-1 call (initially we thought something was on fire) confirmed the burning smell, but were unable to locate the source. They shut down our furnace, thinking something was wrong there. The next day the repairman took apart the furnace and put it back together again; he found nothing wrong. It wasn't until later that the burning rubber smell was replaced by an eerily familiar skunk smell. A look outside in the backyard snow, showed animal tracks that told the whole story. How a possum had entered the skunk's den, a fight erupted (and the skunk sprayed). So now we are left with a house smelling like skunk. Can we use the washing machine and dryer in the basement, where the smell is the strongest? Do I have to hang dry the clothes in a non-skunked location? Will the dryer circulate the basement air and make the clothes smell like skunk? My dog got sprayed by a skunk a couple nights ago. She got in the house and we got her out but our whole house reeks of skunk! I sprayed all kinds of scented sprays like bath and body spice, cinnamon etc. We send kids to school but were notified by all the schools to come get our kids they smelled like skunk! how embarrassing! I did not realize how much the scent would effect everything. It is as if we have been sprayed by the skunk not the dog! we spend the whole day cleaning the house, mopping floors, baking soda on the carpets and burning candles. As soon as we blow the candles out you can still smell it! I have read the advise to put apple cider vinegar and coffee grounds out which this morning I did in hopes this works. I put them in separate bowls is that right or are you suppose to mix the vinegar with the coffee? We have been Febrezing the kids clothes and shoes as well as backpacks and no call from the schools so I guess that is working. This has been a nightmare! What smelled like a 90 year old skunk covered in tire rubber on fire infiltrated my house this fine night. I could hardly breath and I shut the windows. Now I was trapped with this fine smell that would not leave. I remembered I had a can of Oust in the bathroom. This knocked most of the smell down and I was able to get to sleep. I hate the smell of skunk and hate it more when woken to the smell of it burning my nose. 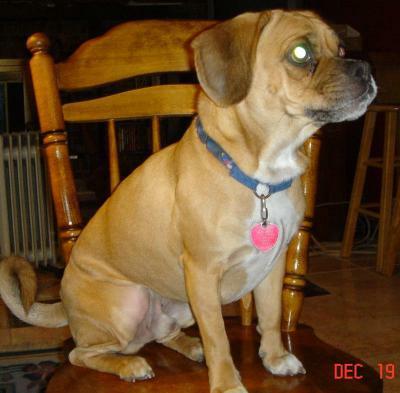 I have a 25 pound puggle that to date has been skunk sprayed 4 times. Two of the 4 incidents were his last outing to pee between 11 and 12 pm. The only process that has really worked is to shampoo him with regular dog shampoo, rinse with water, then rinse with odorxit concentrate solution, and rinse with water again and dry. He always sleeps with us even after being sprayed because there is no odor. Yes, we have tried the peroxide mixture but it does not get all the odor mainly because you can't get it near the dogs eyes and mouth. Yall are great thank you so much I thought my son was joking with me about the rubber smell, so I looked it up! It smells like rubber in the house. Its awful. Thank you for telling me hes not crazy and I am! I thought the heater was broken. Is Skunk Spray Harmful To Dogs?